After seeing a sign for Gore Orphanage Road, Emily Lapisardi was intrigued. Looking into the oddly named byway, she discovered there were local legends and ghost stories associated with it. Regardless of how true these tales of terror were, they certainly seemed like a good starting point for a horror movie. And so GORE ORPHANAGE was conceived, with Emily and her boyfriend Cody Knotts writing the screenplay to be directed by Emily. The finished film will have its premiere Saturday July 11th at 7:00 pm at the State Theatre in Sandusky. I had a chance to ask Emily a few questions about the movie, and here’s what she had to say. CLEVELAND MOVIE BLOG: Tell our readers a little about yourself. Where did you grow up and how did you first become interested in movies, first as a fan, and later as someone who decided to make films of their own? EMILY LAPISARDI: I grew up primarily in southwestern Pennsylvania, but also spent some time in Ireland, where my father was working as a dramaturg at the Abbey Theatre with some of Ireland's top actors. I grew up in the theatre, rather than in the film industry, but when I was fourteen, I left high school to attend the university where my father was teaching at that time. One of my professors there produced shows for the university's TV station and taught me the basics of shooting and editing; we were still using SVHS tapes then, though. I wrote, directed, shot and/or acted in quite a few shows for the station during my time there-- mostly documentaries and programs about theatre. Nearly ten years later, I was cast as the lead in a Civil War docudrama , SPIES IN CRINOLINE, filmed in the Fairfax, Virginia, area, but didn't become seriously involved in film until I began dating Cody Knotts, who was finishing up production on PRO WRESTLERS VS. ZOMBIES at that time. Since I am a professional musician, Cody asked me to serve as the music supervisor for that movie; it was while driving back from signing a band contract for PRO WRESTLERS that we began to think about making GORE ORPHANAGE. Since I am used to working with kids as a voice and piano teacher, Cody felt that I would be a natural fit to direct it. CMB: I understand you became aware of the Gore Orphanage story when you saw a sign for Gore Orphanage Road, but what in particular about this legend appealed to you and made you think it would lend itself well to a movie? EL: The name itself is just fantastic and sounds like it should be a film! As we began to research the legend, we felt that it included so many elements that would contribute to the creation of a haunting and memorable film. Children in danger evoke a strong emotional response and fire triggers deep-seated primal feelings. Obviously, the story has had a strong resonance in northern Ohio for generations. CMB: Given that the stories people tell about the haunting of Gore Orphanage are cobbled together from several different events to begin with, and any resemblance to actual history is purely coincidental, how did you and Cody decide what parts to keep, what to leave out, and where to outright invent things for the sake of a good script? EL: First, we chose not to make a "teens in the woods encounter ghosts" type film; this would certainly have been possible given the subject matter, but we wanted instead to focus on what might have caused an orphanage to burn down with the children trapped inside. We researched the Light of Hope orphanage and the Collinwood school fire, both of which contributed to the legend, and were inspired by the most memorable elements of each. Most of my work tends to be very character-driven, so I wanted to have strong, complex characters at the center of the story; Nellie, the little girl at the center of the film, was part of my conception of the story from the beginning. CMB: How hard was it to put together the financing to make the movie you wanted to make, and yet given the realities of modern distribution, still come in at a low enough figure that the film could be profitable or at least break even? EL: This was Cody's fifth film, and some of the producers from his previous projects were also involved in funding GORE ORPHANAGE. However, we also dipped into our own savings-- and during a period when I was between jobs-- because we believed so strongly in the film. We learned to be very frugal and also had some real luck in finding set dressing, period costumes, and a great-looking location all at reasonable costs. CMB: You have a fairly large cast, including several child actors. What kind of challenges did that pose for you? EL: Independent filmmakers are often warned not to make a period piece or anything involving children because of the difficulties involved, but we chose to do both, and would never have succeeded without the amazing group of kids and their families who were involved. Although the number of hours the kids could work per day were limited, it was still very exhausting and sometimes we all got tired and a little cranky, but they were all so committed and patient. During the summer, when most kids were enjoying free time, our young actors and their families were shooting in a very hot old house day after day. CMB: The story you're telling is a ghost story, but (regardless of the name's actual meaning), with "Gore" in the title people are going to be expecting some blood. Where does 'Gore Orphanage' fall on the scale between quiet supernatural horror and full-on gore fest? EL: There is a bit of blood, but it is somewhere stylistically between Hitchcock and Dario Argento-- a suspense/thriller with a bit of an art house feel. Some of the scenes are certainly disturbing, especially if you feel any sympathy towards children, but it is not extremely gruesome. CMB: After the premiere in Sandusky, what's next? Are you planning to take this on the festival/horror convention circuit, or do you have a distributor lined up for home video and VOD? EL: GORE ORPHANAGE will be shown in limited release in Ohio, Pennsylvania, and West Virginia-- and possibly other areas, as well. We will also be involved in a few festivals, including the first Lake Erie Arts and Film festival. It will also be available on DVD, Blu-ray, and streaming. CMB: Any plans for your next project? EL: We're working on several projects simultaneously right now. Cody is currently writing a script for a remarkable story based on the life experiences of former army chaplain David Peters, whose autobiographical book “Death Letter” has been praised by NPR, Huffington Post, and Fox News. This is not just another war film, but a shockingly different and deeply moving story. We're also shooting a sizzle reel in the fall for an historical project which means a great deal to me. Additionally, I've written a treatment for a horror film set in New England in the nineteenth century which Cody just loves and is planning to develop into a screenplay. CMB: Anything else you want to mention that I didn't touch on? EL: The novel I wrote based on the film is already available in paperback on Amazon.com and also through Kindle. There were so many details which the cast and I worked out about the characters and the orphanage while we were filming that I felt a book incorporating this background would be a great companion to the film. Some stories haunt the imagination. 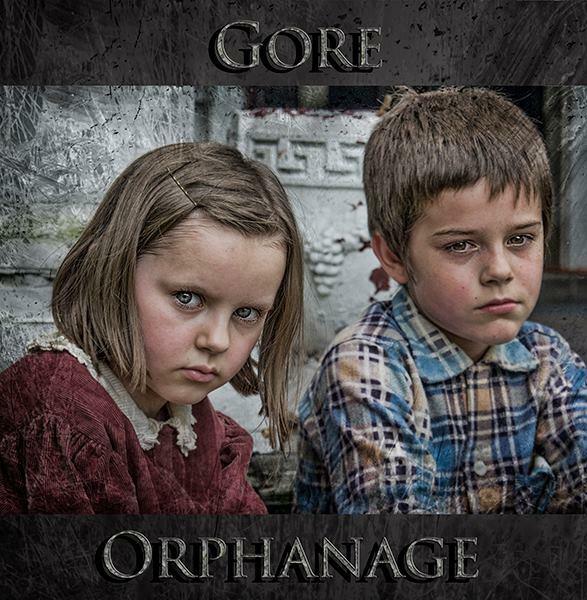 The tale of Gore Orphanage has been one of those to me and, judging by the overwhelming response we have received thus far, to many others, as well.